A breathtaking journey along the world’s most important rivers, from the author of international bestseller Timeline. 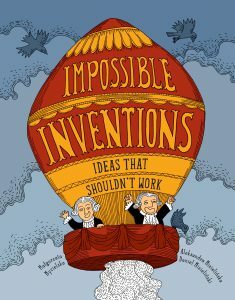 A non fiction book for children and all ages. This breathtaking journey on the world’s most important rivers, seas and oceans tells the story of our planet through cultures, myths, icons and history. It takes us from the Nile to the Amazon, the Mekong Delta to the Mississippi, the Murray to the Waikato. Each map is full of fascinating facts about nature, culture and history, with major events and historical figures alongside favourite stories and icons. As the life source of people, animals and the land itself, the world’s waterways tell a compelling story about our history and our lives today. 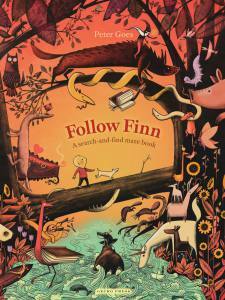 This absorbing, playful book shows who we are, how we live and the myths we weave around our people and places. A non fiction book for children and all ages. 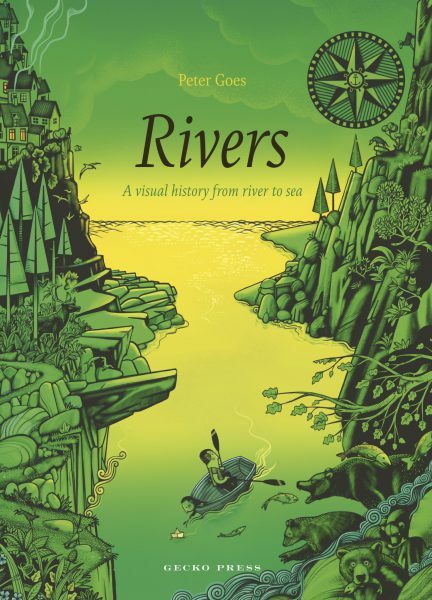 Rivers focuses on each two-page, full-background colored spread on a specific river or area, highlighting important facts, weaving in an incredible number of engaging and little-known bits of information, in a sweeping manner of presentation that has readers feeling they are riding the currents along with the text. 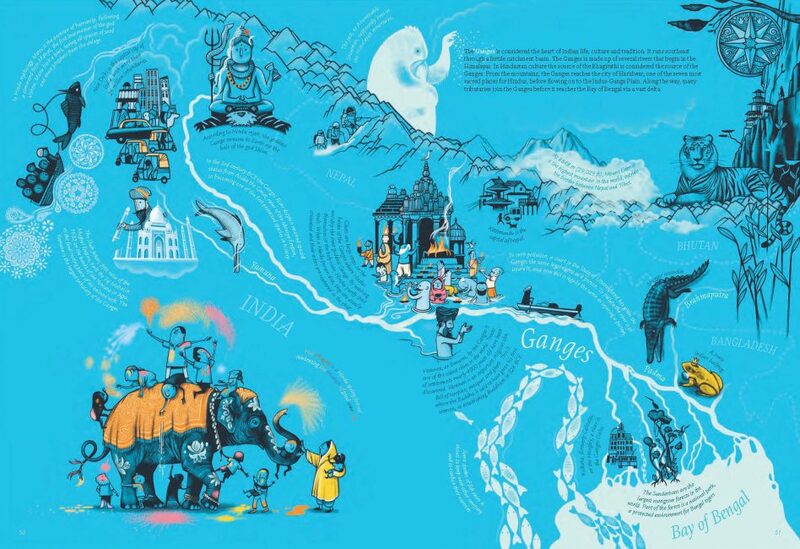 A wonderful meandering journey through some of the world’s most famous rivers, in exquisite illustrated form. Even includes an amazing spread on the mighty Waikato. Belgium artist Peter goes has poured so much detail. and thought into such a masterful creation…It is truely a visual wonder. Each new inked spread comes with its own set of monochromatic or dual-tone illustrations, though Goes spices in pops of color here and there for fun emphasis. The illustrations walk the fine line between comical and realistic, and in addition to the information we read about the river we also get a sentence or two about featured animals and local stories. 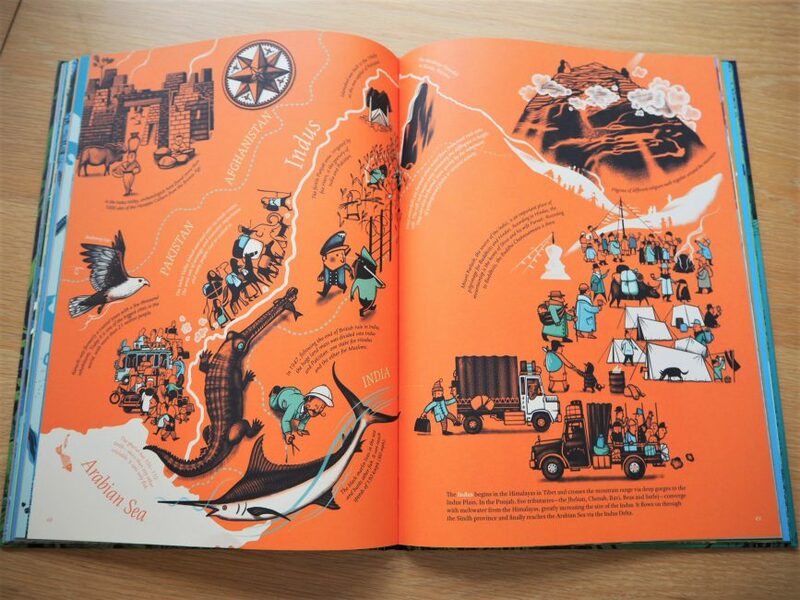 Rivers by Peter Goes is overflowing with illustrations and information. Illustrator @goes.peter creates a breathtaking journey along the most important rivers in the world. From the Nile, to the Amazon, the Mekong Delta to the Mississippi, the Murray to the Waikato. Through tracking the life source of people, animals and the land itself, Peter Goes brings alive our history and our lives today. 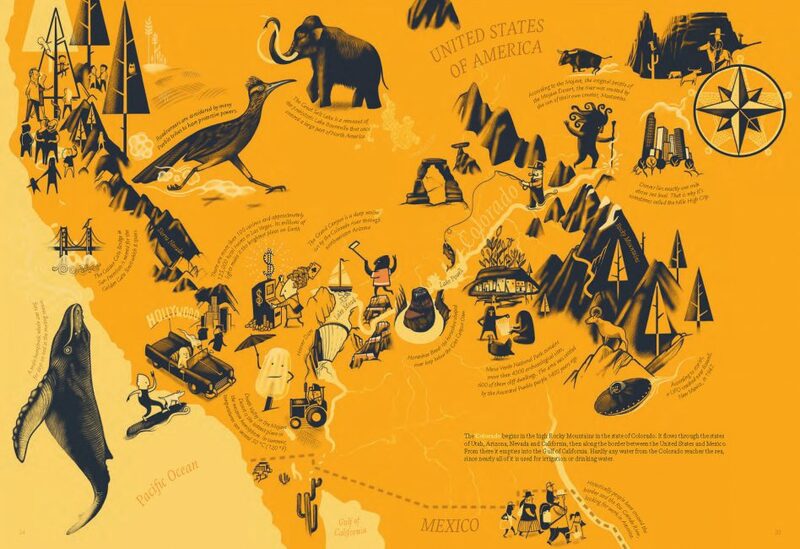 Each illustration includes major events and historical figures connected with its river, but also favorite stories and icons. This absorbing, playful book shows who we are, how we live and the myths we weave around our people and places. This title could never do justice to a book like this. 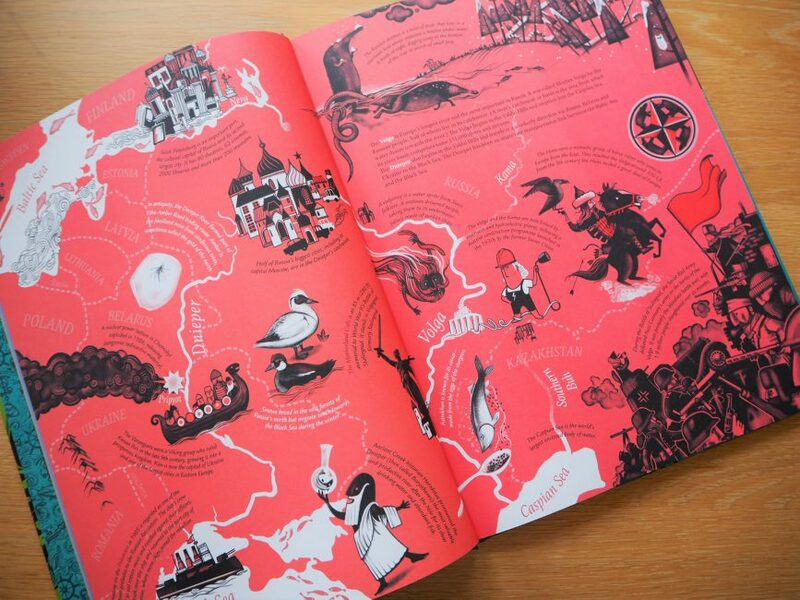 The book has geography, history and adventure all rolled into one. Is worth every penny. 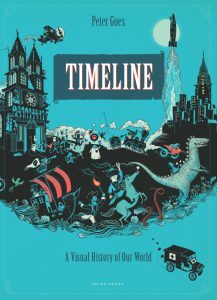 The author of the international bestseller Timeline brings readers another gorgeously illustrated piece of art. The author dives into how rivers across all seven continents connect the world and impact the way people live… Children will want to sit with this book and pore over the images and facts provided. 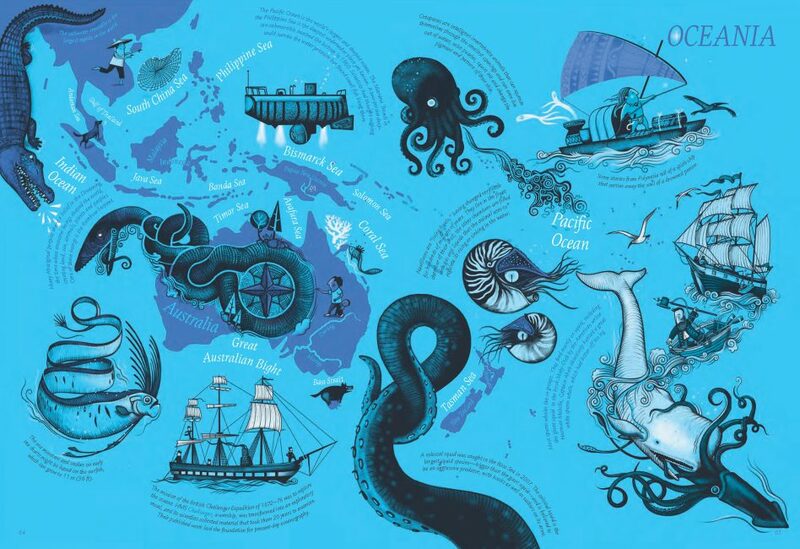 Packed with beautiful large-format, full-colour infographics and maps, this amazing river ride is a beautiful gift for adults, a lively reference book for children, and a teaching tool in classrooms. 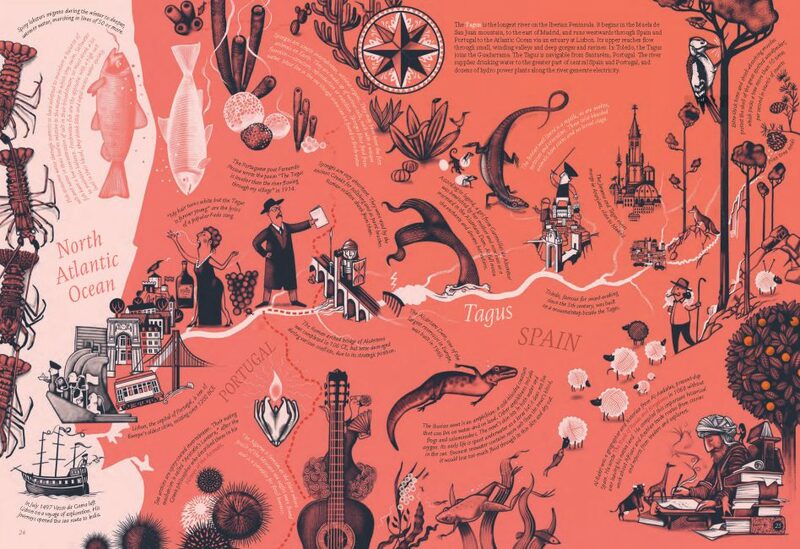 Each map and illustration is full of fascinating facts about nature, culture and history, with major events and historical figures featured alongside favourite stories and icons. Hold. The. Phone. Have you seen THIS?? Game over. It manages that rare thing of taking facts, history, knowledge, and presenting them in a way that makes them feel magical. Come and see it. Now. 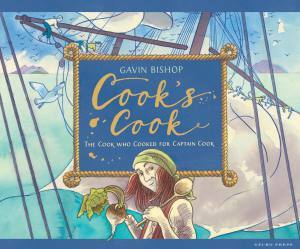 A fascinating book for young would-be travellers and school libraries in particular. Again another beautiful Gecko Press Book. This is hardback and really eye catching. The cover has got this bright palate of green and yellow and each page concentrates on one colour, which keeps it really simple but really beautiful.